In the early morning hours of 15 August, 1941, Josef Jakobs was seated in a wooden Windsor chair in the miniature rifle range at the Tower of London. A circular target was attached to his chest by the doctor attending. After the execution, the target disappeared. Over the years, various stories have emerged around the target used on that fateful day. In 2000, the authors of Tales of the Tower (Donnelly & Diehl) stated that the target was a piece of black cloth cut in the shape of a heart (p. 191). Their account was, however, highly suspect given their tendency to fictionalize the story of Josef. Close-up of the Shot at Dawn memorial. Geoffrey Abbot, a former Beefeater from the Tower, stated that a circle of linen was used as the target. One of the Military Policemen who had guarded Josef at Wandsworth Prison, and who was present at the execution, stated that a white metal disc was used as the target. There is some evidence to support the use of metal disc, one has only to look closely at the "Shot at Dawn" statue which commemorates British soldiers who were shot for desertion or cowardice during World War I. The statue clearly shows what appears to be a metal disk on a string/chain around the soldier's neck. Could Josef have had a similar target placed around his neck? Lint Circle held at the Scots Guards Museum. 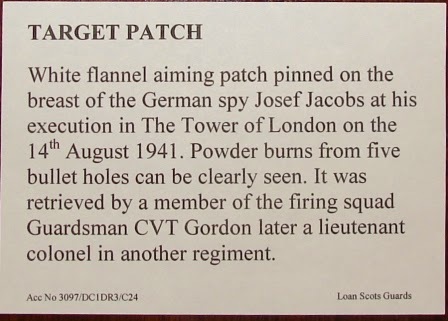 In the mid 1970s, Sir Winston Ramsey, editor of After the Battle magazine traced the target that had pinned to Josef's chest to the Scots Guards Museum in London. The target was a white lint circle and showed evidence of the passage of five bullets. White flannel aiming patch pinned on the breast of the German spy Josef Jacobs at his execution in the Tower of London on the 14 August 1941. Powder burns from five bullet holes can be clearly seen. It was retrieved by a member of the firing squad Guardsman CVT Gordon later a lieutenant colonel in another regiment. A bit of research revealed that the person in question was Colin Victor Thomson Gordon. Colin was born 30 September 1897 in Dennistoun, Glasgow. His parents were William Gordon and Jeanie Thomson. In 1914, Colin enlisted in the Scots Guards and served in France in 1914, 1915 and 1917. On 26 June, 1918, shortly before the end of the war, Colin was commissioned as an Second Lieutenant in the South Staffordshire Regiment. After the war, Colin spent five years in Singapore and Burma with the 1st Battalion of the Staffords. After returning to England for a brief tour of duty at the Depot, Colin was seconded to the Royal West Africa Frontier Force in 1927. He spent most of the next nine years in Africa, including Sierra Leone and Nigeria. On 1 May 1928, Lt. Gordon was promoted to the rank of Captain. In 1932, Colin married Colleen Kemp in London. In 1939, with the outbreak of war, Colin was once again at the Depot of the Staffords and ended up commanding the Infantry Training Centre from 1940 to 1941. He later commanded the 9th Battalion. Major Gordon retired in 3 June, 1946, with the honorary rank of Lieutenant Colonel and settled in Torquay, Devon. In 1959, the South Staffordshire and North Staffordshire regiments were amalgamated into the Staffordshier Regiment. Colin was a strong supporter of the Regimental Association of the Staffords and took part in a reunion in 1974. Shortly afterwards he was in a serious car accident and lost a leg. Through sheer strength of character and determination, Colin came to grips with his disability and conquered the use of an artificial leg. Colin passed away in Devon on 18 April 1982 at the age of 85 years. He was predeceased by his wife (1973) and survived by a daughter living in America. In 2007, the Staffordshire Regiment and two other regiments were amalgamated into the Mercian Regiment. There is only one small problem. C.V.T. Gordon was a member of the Scots Guards during World War I NOT World War II. By the time World War II rolled around, Gordon was a Major with the South Staffordshire Regiment and commanding an Infantry Training Centre. There was another C.V.T. Gordon who was a Guardsman during World War II and present at Josef's execution (unlikely). Colin Victor Thomson Gordon, Guardsman in World War I, was present at the execution of a World War I spy and the lint circle belongs to that spy. Colin Gordon was stationed in France in 1914, 1915 and 1917. He could have been attached to the 3rd Battalion of the Scots Guards in 1916, the battalion that provided the soldiers for firing squads at the Tower during World War I. The lint circle is the one that was used at Josef's execution but the reference to C.V.T. Gordon is a curatorial mix-up. Which leads to the question - is the lint circle that is in possession of the Scots Guards actually the one that was used at the execution at Josef Jakobs? Or was it used at the execution of a World War I spy? A Yeoman Warder at the Tower of London has suggested in a private conversation that the lint circle at the Scots Guards Museum is not from the execution of Josef Jakobs. He indicated that someone else had the target used at Josef's execution in their possession. Obituary & Brief Biography of Lt. Col. C.V.T. Gordon - this link no longer functions - the obituary was provided by Whittington Barracks.